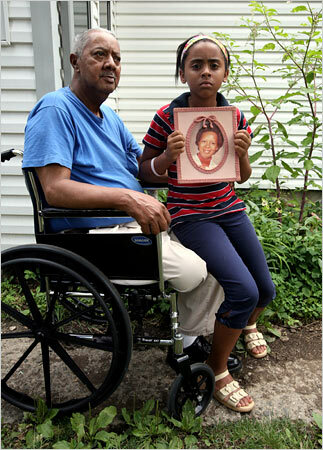 This New York Times image from 2007 shows Paul Eugene VanDunk with granddaughter Alexis Dennison holding a photo of her mother, a cancer victim. VanDunk and other residents of Upper Ringwood blame many cases of sickness and death on toxic paint sludge and other waste dumped in their neighborhood by Ford Motor Co., which operated an assembly plant in nearby Mahwah until the late 1970s. The Record's front page today is promoting a controversial plan to pave over toxic soil in several North Jersey towns that would save Ford, DuPont and other wealthy corporate polluters tens of millions of dollars. Assurances that capping 166,000 tons of paint sludge is safe are falling on the deaf ears of Upper Ringwood residents a few months before a referendum that would force Ford Motor Co. and borough officials to remove the pollutants (A-1). The Environmental Protection Agency would allow the waste to stay in the ground even though North Jersey's drinking-water reservoirs are nearby. What remains unclear is what motivates Editor Deirdre Sykes and Staff Writer Scott Fallon to turn their backs on long-suffering residents, and to forcefully promote an unpopular solution to decades of corporate pollution. With capping, Ford and the borough of Ringwood's insurers would see their cleanup costs drop to $5.4 million from $32.6 million (A-8). At a Superfund site in Edgewater, Honeywell and other wealthy companies held responsible for the pollution would pay only $72 million, compared to $205 million for excavation. One story you've never seen in The Record is a dramatic decline in the enforcement of speeding laws on state highways -- even as the Road Warrior columnist obsesses over lines at the Motor Vehicle Commission and traffic jams at MetLife Stadium (L-1). Today's front-page story should have reported Christopher Boes, 20, of West Milford might be alive, if Butler police did a better job of patrolling Route 23 and stopped such racers as the friend driving the car in which he was a passenger (A-1). Check out the hysteria over the war between New Jersey and New York on replacing the antiquated Port Authority Bus Terminal in Manhattan (L-1). The two states have been arguing for decades over which one gets the most from the Port Authority of New York and New Jersey. Originally, the agency was called the Port of New York Authority. We're probably going to see many more stories on where a new Manhattan bus terminal should be located. But The Record won't be asking the bi-state agency why it doesn't expand bus service by adding one or two more exclusive bus lanes into the Lincoln Tunnel. Staff Writer Elisa Ung is so excited about Turtle + The Wolf in Montclair, she calls the New American BYO "unique," and rates it as Excellent to Outstanding (a half-star shy of the top rating of 4 stars). And although she praises the "quality" of the food, only the brisket she sampled was naturally raised at Painted Hills Farm in Oregon (BL-14). So, are readers to assume the $72-a-person roasted pig and the $45-a-person fried chicken dinners are conventionally raised with harmful antibiotics? The money you save on wine will be blown on tolls and gasoline to get there and back. And does the place serve any seafood except octopus? She might have been able to provide more details on the food, if she didn't feel compelled to report details of the chef-owner's resume and identify his business partner, whose last name she misspells. Ung calls him "Matt Greneven," but today's correction says he is "Matt Trevenen." Maybe she drank too much of the wine she brought or was overly giddy about eating hundreds of dollars of food -- plus dessert -- paid for by Gannett, The Record's owner. Corrections usually run on A-2 the day after the error is made, but today's notes the review "was produced in advance." Turns out the rave review appeared online on Thursday, almost a full day before the print edition.